PHILADELPHIA -- Cover your eyes, Dallas Cowboys fans. Noted supporter LeBron James is on the Wentz Wagon. 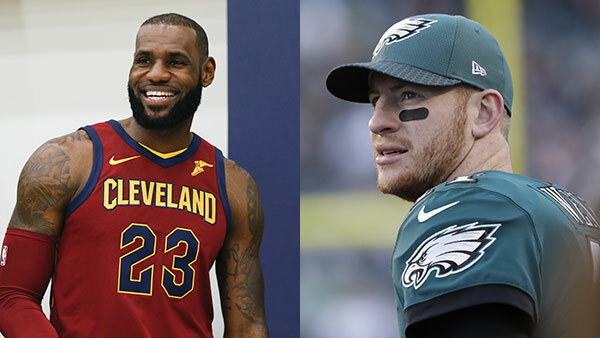 While in town to play the 76ers, the Cleveland Cavaliers' star forward revealed that Philadelphia Eagles quarterback Carson Wentz is his favorite football player. James said that there are a few players that he loves to watch, including Patriots QB Tom Brady and Steelers receiver Antonio Brown and running back Le'Veon Bell, but tops on the list at the moment is the Eagles' second-year quarterback. "My favorite player right now is Carson Wentz," James said Monday morning. "I told my brother that early in the season that I just love the way he plays the game. The way that he's able to get to progressions throughout the course of a three-step drop or a five-step drop, and if everything breaks down, his ability to run, get outside the pocket, either make passes or get yards with his feet. "He's a very smart player from the outside looking in, obviously, and they've got a really good team. I'm a Cowboys fan, I'm a Browns fan, but I'm a fan of sports and I know sports." Wentz posted his fifth game this season with at least three passing touchdowns in a 31-3 win over the Bears on Sunday. Elias Sports Bureau research says that Wentz's 28 TDs this season trail only Dan Marino in 1984 (30) and Kurt Warner in 1999 (29) for the most passing TDs through 11 team games by a first- or second-year quarterback. His MVP level of play is a big factor in the Eagles' 10-1 start. James was asked, as a fan of the 0-11 Browns, if he's disappointed that Cleveland passed on Wentz. "They passed on a lot of people," James replied with a smile.